Villa Ravina is an elegant historic villa built in 1812 with apartments and unfinished buildings, inserted in a botanical park of 10,000 sqm that slopes down to the river Lambro. 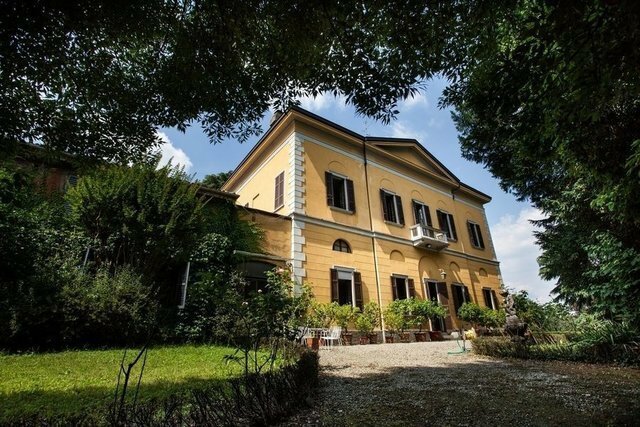 The property is characterized, on the ground floor, by an entrance hall, living room with fireplace and frescoed ceilings, studio, dining room, hallway, imposing stone staircase, office, veranda, kitchen with fireplace and guest bathroom. On the first floor, eight bedrooms, two of which are characterized by barrel ceilings and panoramic views on the Brianza hills, and three bathrooms. Between the ground floor and the first floor there is a mezzanine with four rooms with ceilings of 240 cm. On the second floor there are four attic rooms and the entry of the panoramic tower which is at a higher level. The real estate includes: a two-bedroom apartment with bathroom, living room, kitchen and large hobby room, another apartment on two levels, an uninhabited building with a new roof and a badly maintained farmstead. Inside the park there is also a small church with hints of frescoed ceilings and walls. The property does not have a heating system but several fireplaces and two majolica stoves. Verano Brianza is a village of medieval origin that is located 15 kilometers from Monza and less than 30 kilometers from Milan.